Back around 1990, a couple of the founding members of the coed Microtones decided that they wanted to form a men's a cappella group at Microsoft so that they could sing the charts from their college groups. The original quartet consisted John Rae-Grant, bass and musical director, Bill Pope, baritone, Bob Gunderson, 2nd tenor, and David Olsen, 1st tenor. True to their profession, the group's chosen name, The Baudboys, referred to the method by which modem speeds were rated. The group performed only a few times in its first years of existence, doing lunch time gigs on the Microsoft campus. As members left Microsoft over the years, they would also leave the Baudboys, prompting natural turnover in the membership. During the 1990's, the group expanded it's membership, aiming to have two full quartets within the group. Since that time, the group has remained at 7-9 members, but the expanded membership has allowed the group to sing more complex arrangements than the 4-part charts that the founders envisioned. The Baudboys, the Undisputed Kings of Geek A Cappella, compete in the 2011 Northwest Harmony Sweepstakes, where they sweep the competition. They took home First Place Overall, Audience Favorite and Best Original Arrangement in a performance that one audience member called, "The most dominant performance I've ever seen on this stage." "People Get Ready," "She's Out of My Life" and "Freedom 90" were all arranged by the Baudboys. 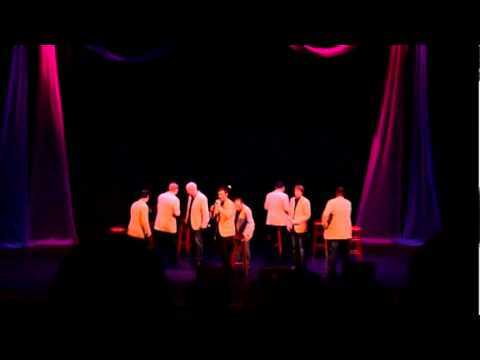 We had the pleasure of catching 8-man Baudboys, "the Undisputed Kings of Geek A Cappella," live at the 2008 Harmony Sweeps Finals, and we look forward to seeing them again at the 2011 Finals, as they won the Pacific Northwest Regional again this year. Composed entirely of Microsoft employees and alumni, this a cappella group has been performing up and down the West Coast for more than two decades, thrilling audiences with their irresistible combination of musical excellence and geek comedy. 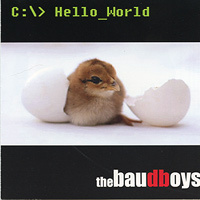 "Hello_World," the group's debut recording, has 11 winning covers, with a fair amount of very funny lyric "augmentation" thrown in. Some of our favorites are the Red Hot Chili Peppers' "Aeroplane," Mentor Williams and Dobie Gray's anthem "Drift Away," a quintessentially geek/gamer take on Tripod's "Gonna Make You Happy Tonight," Sting's "Every Little Thing She Does is Magic," Stevie Wonder's moody "Overjoyed," a particularly graphic cover of Weird Al Yankovic's "One More Minute," Cub's manic "New York City," Al Jarreau & Michael Omartian's jazzy, scattish "Boogie Down," Joseph Shabalala & Paul Simon's "Homeless/Diamonds on the Soles of Her Shoes" and a completely incongruous, yet lovely, live cut of Dmytrovych Leontovych & Peter Wilhousky's "Carol of the Bells." The Baudboys have a fresh, (dare we say) modern sound, understated vocal percussion and background harmonies, sweet leads, great arrangements and a great sense of humor. Don't miss this impressive, surprising, big fun debut CD from Seattle's talented, slightly crazed Baudboys!